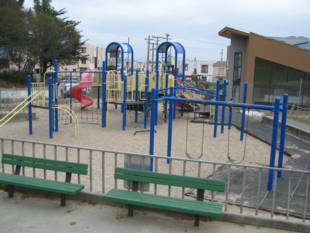 Herz Playground provides a play structure with sand pit, tennis courts, basketball court, and a combined soccer/baseball/softball field. There are picnic tables and space for dogs. Restrooms and on-site parking are available. Coffman Pool is an indoor pool that measures 100 feet long by 40 feet wide, with depths from four to 10 feet. It is one of the only pools in the city that offers regular swim classes. Times may vary so call the facility at 337-9085 to confirm. 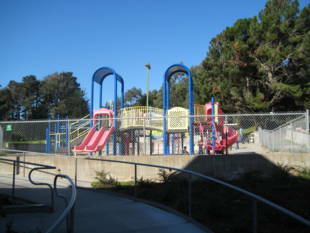 Herz Playground and Coffman Pool are owned by the San Francisco Recreation and Park Department. *8X/8BX-Bayshore Express -- Visitacion Ave. and Hahn St.
*56-Rutland -- Visitacion Ave. and Hahn St. Admission: Adults $5; Children $1. Water aerobics are a dollar extra for both children and adults. 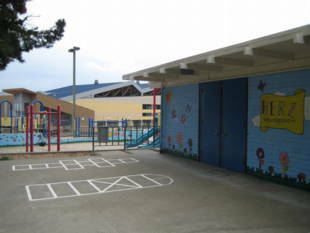 Swim classes, open swim hours, and Tiny Tots are available at Coffman Pool. Call 337-9085 to verify the schedules. 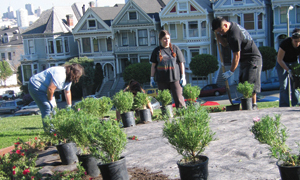 Hahn St. & Visitacion Ave.